Junior Research Fellow (JRF) - M.Sc., B.Sc. (Emoluments @ Rs. 25,000/- per month for the 1 st and 2nd Year and on designation as Senior Research Fellow (SRF) by a committee @ Rs. 28,000 from 3rd year). Not exceeding 35 years on the date of advertisement with relaxation as per Govt. of India rules. M.Sc. Forestry with B.Sc. Forestry/M.Sc. Forestry (B.Sc. Basic science)+NET. Candidates with M.Sc. in related subject with net may also apply.  Applications should state name, address, date of birth, educational qualifications and experience etc. as CV should reach the undersigned on or before 26.04.2019 preferably through email: sk_tripathi@rediffmail.com  The post is purely temporary and co-terminus with the tenure of the project. The appointment does not carry any entitlement or right over the job and will not be considered as formal service.  No TA and DA will be paid for appearing in the walk-in-interview.  PI may be contacted for any additional information. 30- 04-2019 (Tuesday) at 10:30 a.m. Junior Research Fellow Vacancy – Last Date (Interview) 26 April 2019 (Aizawl, Mizoram), Mizoram University recruits Junior Research Fellow post. M.Sc., B.Sc. experienced candidates can apply. Post Graduate Degree in Basic Science. The selected PA will work at Department of Biotechnology, Mizoram University. Students having working experience on microbial fermentation and microbial natural products will be preferred. Rs 22000/- per month (Consolidated). Applications, neatly typed on plain paper along with attested photocopies of mark sheets and certificates should be submitted on the date of the walk in interview. All the Original certificates should be produced for verification at the time of interview. Department of Biotechnology, Mizoram University. Project Assistant Vacancy – Last Date (Interview) 18 December 2018, Mizoram University recruits Project Assistant post. Post Graduate experienced candidates can apply. 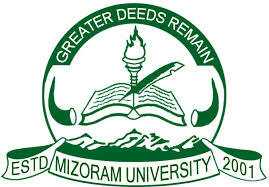 Mizoram University is a central university under the University Grants Commission, Government of India, and was established on July 2, 2001, by the Mizoram University Act (2000) of the Parliament of India. The President of India is the official Visitor, and the Governor of Mizoram acts as the Chief Rector as per Mizoram University (Amendment) Bill, 2007. According to the Act, the objectives of the university are “to disseminate and advance knowledge by providing instructional and research facilities in such branches of learning as it may deem fit, to make provisions for integrated courses in humanities, natural and physical sciences, social sciences, forestry and other allied disciplines in the educational programmes of the University; to take appropriate measures for promoting innovations in teaching-disciplinary studies and research; to educate and train man-power in the development of the state of Mizoram; and to pay special attention to the improvement of the social and economic conditions and welfare of the people of that State, their intellectual, academic and cultural development”. Keeping these objectives in view, MZU has embarked on various programmes for academic and administrative development.